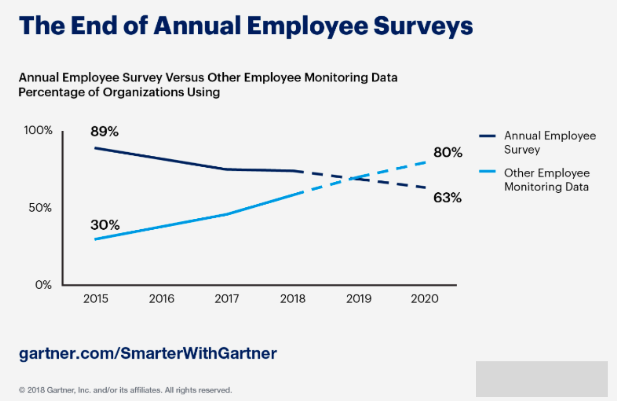 A study done by Gartner(*1) confirmed that organisations are moving away from annual employee engagement surveys after realising they’re not enough to capture the voice of the employee. Even though email surveys aren’t extinct yet, they do look like flint tools when you compare them with a modern arsenal of real-time analytics and engagement engines. Moreover, in organizations, to actually improve employee experience, you need to understand how employees are feeling at regular intervals that are relevant to their lifecycle and not the company’s. In 2019: HRBPs need timely, contextual, and frequent touchpoints to capture organisation pulse and employee sentiment. It’s humanly impossible to have these conversations manually for HRBPs. However, for an AI enabled engagement bot, which is capable of understanding emotion, 1:1 conversations become easier to do. While such a chatbot may never be able to replace HRBPs, it can work 24x7 tirelessly and be the perfect assistant enabling them to take the right decisions and meet the right people who need attention in the organisation. In 2019: HR leaders from companies like GE, Makemytrip, Nestle are now using AI-based engagement strategy to forecast and control attrition in their organisations upto 12% YoY. Poitevin further comments that this could be a role NLP enabled chatbots with a personality may be able to fill seamlessly. Over time, we’ve learnt that making interactions relatable, likeable, and fostering respect has positively shown employees open up to bots about their problems at work. Sentiments hidden behind every such interaction can reveal startling leading trends. Employees who choose to behave abusively toward an AI-driven chatbot are likely to treat co-workers the same way. Even if an employee avoids interacting with an engagement bot, it might be indicative of a deeper issue. In 2019: Around 74% of employees who dropped out of chats or refused to interact with Amber were among those who left their respective organizations. Is my organisation investing in AI in its early stages to reap the benefits of maturity down the road? How am I measuring the RoI through these implementations? Do I have the right partners in place to accelerate implementation? Is your employee engagement strategy relevant to 2019? !